A very dull political coverup movie that gets overly complicated as it digs into real estate deals and legal issues. A movie that starts off with some potential, but then gets very dull and unineteresting in it’s second half. This film is about a mayor who hires a guy to tail his wife. There’s an unexpected murder, and then all of a sudden the film shifts gears to become about a real estate scam. There are a lot of pieces here and they don’t all quite fit together or flow smoothly into each other. Not only is the real estate situation complicated, it’s also not very interesting. What we’re left with is a movie that vaguely resembles other, better films as it attempts to be like those movies and ends up tripping over it’s own feet along the way. Broken City is a mess of a movie. I wasn’t sure what to expect, but I definitely knew it wasn’t going to be very good. From the cast of former a list stars who haven’t had a good movie in ages to the director, Allen Hughes, who hasn’t made a movie worth talking about since menace II society, this movie felt like it was just thrown together out of broken pieces. On top of that the film was released in January, a notoriously terrible month, or what the studios refer to as the dumping ground for their lousy movies. There was little to no press, and whatever there actually was of a trailer, made it look like a thousand films that we’ve seen before. The trailer showed us that Wahlberg’s former cop, Billy Taggart, is hired by the mayor, Hostetler (Russell Crowe), to follow his wife and find out who she is having an affair with. Taggart takes the job and snaps some photos, only to find out that he is being set up for something and that the mayor had other intentions and a hidden agenda when he hired Taggart for the job. We don’t know exactly how taggart is setup, but we can only assume that it will be something like wahlberg’s film shooter, or the first machete film. both of those movies had basically the same plot. a guy is hired to watch over a political figure and make sure there is no assassination. then the assassination does happen and this guy is setup to look like the person he did it. 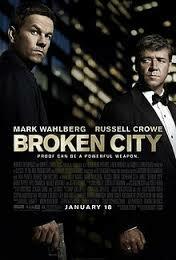 luckily, broken city does not follow that same plot line. yes, there is a death of someone that taggart was watching, but it’s not as simple as them setting taggart up to look like the person who did the killing. this movie trades simple for complicated, never stopping to find in between ground. the first thirty minutes or so are the routine part, where taggart is hired by the mayor to follow his wife. before that, we see a lenghty flashback of the time when taggart lost his stripes and had his badge taken away from him, by the mayor himself. the movie opens with this sequence where taggart shoots a guy who was unarmed and surrendering, and the whole thing is played out in the media. it’s the kind of opening we’ve seen before, but usually as just a quick scene. this movie plays it out for a while, making us think it is more than just a flashback. the sequence actually works. especially as we find out more about the motives behind it, and why taggart felt he was justified, later on in the film. now it’s seven years later and taggart is a private investigator. he is owed tons of money by his former clients who hired him to take pictures of people having affairs and then never paid up. the first problem with this movie is that it has no imagination and doesn’t even try. every single issue this guy has dealt with apparently was someone hiring him to catch their spouse having an affair. we hear about a case from a woman on the phone who doesn’t think she should have to pay since her husband was the one cheating. then we see a situation with taggart snapping photos through the window of a guy’s house, and getting into a fight when the guy comes out. and then, of course is the russell crowe’s wife affair. does this private detective do anything else? does he find people who have gone missing (the spencer books by robert b. parker), or help people track down their former lives (the long kiss goodnight?) none of that is ever mentioned. the mayor hires taggart and he gets to work. he starts following the mayor’s wife, cathleen, (catherine zeta-jones), and snaps photos of her meeting with a guy named paul andrews (kyle chandler.) at one point, taggart even follows andrew out to long island on a train and gets caught up in a conversation with the very guy he’s targetting. the discuss politics and unions and things like that and it’s the first sign that this movie has the potential to get boring if it gets too political and forgets to have fun. unfortunately, that’s exactly what happens. andrews ends up dead, right after taggart hands the mayor the photos, and the mayor learns that this is the man his wife was having an affair with. so taggart knows the mayor killed this guy or had him killed, and he knows the reason why. that’s all pretty straight forward. taggart is not being setup as the guy who did the murder or anything like that. yet, all of a sudden, he starts acting like he is. he says things like, “the mayor’s setting me up,” and “his wife was never having an affair. something else was going on.” how in the world does he know this? it seems pretty reasonable that his wife was having an affair with this man, and that’s why the mayor had him killed. but taggart doesn’t need logic or sensibility. he has his own way of figuring things out, and the movie should have really clued us in on what that way is. at this point the movie starts going downhill fast. it’s maybe about halfway into the film, and suddenly just about all their cards are out on the table, exposed, with no surprises or ways of working the audience left. we find out who the kyle chandler character really was in relation to catherine, and the rest is in the bag. only the movie still has a solid half to go, and nothing new to offer during that time. for this reason, it devises a storyline about real estate. the real estate story is more boring than anything else. it’s about the mayor buying up land and trying to sell it illegally. the whole thing reminded me a lot of the corrupt real estate deal in the movie primal fear, that was being done behind closed doors, by some of the most prominent figures in the city. the difference is that in primal fear, this real estate situation was used as a minor backstory scenario that played out mostly behind the scene while bigger and more exciting things, such as a murder and multiple personality disorder, got to take center stage. the real estate plot in that movie was never vital in our understanding of the story, but just a nice backdrop of the world that the film was set in. here, in broken city, however, that real estate deal is everything. broken city is one of those movies that absolutely gets worse and worse as it goes on. the ending, in which a character makes a final move that is more stupid than bold, makes absolutely no sense at all. but the movie loses our attention and interest long before that. these are likeable movie stars on hand here, but they clearly know they are in a movie that is more of a joke than a serious contender for being a decent film. wahlberg has been in lots of low budget, low profile, lousy movies like this lately, such as contraband or the happening. russell crowe isn’t any better. there are lots of problems with this movie, including how overly complicated and unineresting the real estate plot was. there’s a story here that feels like it’s been put together from the parts of other films that came befoe it. this one definitely does not work.